The recent murders of unarmed black men in several US cities have enraged thousands of people, both nationally and globally. They have also resulted in the creation of movements that call for the black community to withhold the $1 trillion in buying power from major corporations and instead to spend them with black owned businesses. I support this message because well structured black businesses that offer quality goods and services deserve a chance to survive and thrive just as much as any other business does. Currently, all other communities in the US practice group economics at a high level. They buy from their own people, help their businesses grow and strengthen their economic and political power base. It is common sense and I’m not upset about it. They understand the game and are playing it because this it is in their best interest to do so. Unfortunately, the black community has not yet fully embraced this method of economic development. From the 1880’s into the 1960’s, a majority of American states enforced segregation through “Jim Crow” laws . Black people were prevented from patronizing white businesses and establishments. This forced them to create their own businesses and transact with each other. The black dollar circulated within the community several times over before leaving, bringing rise to hundreds of successful black businesses. 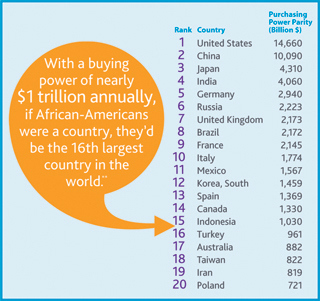 The buying power of black people during that era was used to strengthen their economic power base and create wealth. It did so until the end of Jim Crow in 1965 when integration became legal. At that point, black dollars started leaking from the community and have not been back since. Now, over 90% of black income is spent in other communities. This is why the term “buying power” is a bit misleading. It is currently just a marketing phrase that defines the ability of a certain demographic to spend its disposable income with different corporations. Are we spending this income on items that appreciate or depreciate in value? Are we increasing debt incurred when exercising this “power” with credit cards? Power can defined as the ability to control people and things. 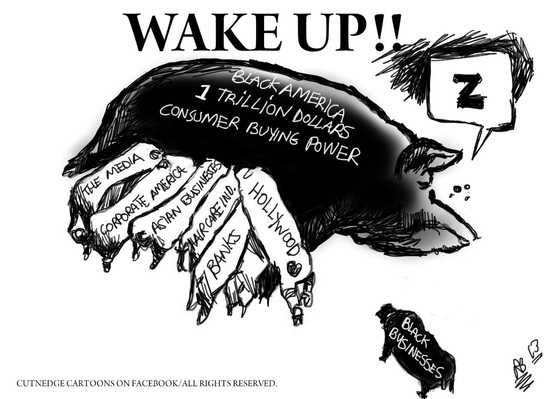 What does the black buying power currently control or influence? From what I can tell, it influences the allocation of corporate marketing budgets. It controls who corporations will target to make the most profit from a certain good or service. It does not seem to control or influence anything that contributes value to the community from which the dollars come from. A trillion dollars of buying “power” could and should even have an international reach. Nigerian billionaire investor and philanthropist, Tony Elumelu recently announced that he has committed $100 million to create 10,000 entrepreneurs across Africa over the next 10 years, targeting the creation of 1,000,000 new jobs and $10 billion in annual revenues. True buying power should be able to accomplish something similar even if on a much smaller scale. How about pooling $10,000 to create or support a well planned business that manufactures, distributes and sells certain food or non food items that the black community and even other communities already spend millions on each year? There are many stigmas attached to black businesses, some accurate and many not. Over the past few weeks I have done some research and come across several black owned businesses that I never knew existed. These businesses provide products and services that are simply amazing! I’m asking that we begin to think and spend more strategically just as others are doing.